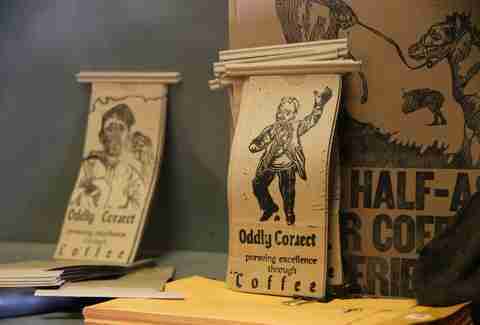 These days, you can get a great cup of coffee in almost any American city, but despite the ubiquity of quality coffee beans, some grounds are more hallowed than others. When comparing the coffee cultures in different cities, there are a lot of elements to consider. Historical significance, industry influence, progressiveness of micro-roasters, number of quality cafes, and how snobby the baristas are all come into play, as well as an overall, totally nebulous sense of city identity. It's impossible to take a scientific approach with so many factors involved, but to have the best grasp on the national coffee landscape we consulted a distinguished group of coffee roasters, baristas, writers, and industry leaders to get their opinions on which cities are currently leading the pack. 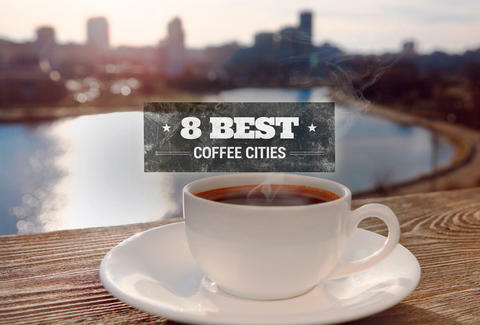 These are the eight best cities for coffee lovers. No cream or sugar required. Outside of small roasters, the Midwest isn't usually considered a hotbed of java, but Kansas City rounds out our list thanks to a surprisingly rich coffee culture dating back to early '90s trailblazer PT's, which now cranks out 100 tons of beans a year, but hasn't sacrificed quality despite its juggernaut status (the beanery ranked #5 on our list of best roasters). But one great company does not a coffee city make. KC's roasting ranks are bolstered by the likes of The Roasterie (which has been at it even longer than PT's), cult favorites like Oddly Correct, and shops with a meticulous mind for brewing like Quay and Second Best, which have to keep their shots on point in case Specialty Coffee Association of America president and hometown hero Tracy Allen happens to stop by. For a city where drinking hot coffee in the afternoon is a ludicrous idea four months out of the year, Austin's scene is booming. For a while, the city's college-slacker mentality meant shops were traditionally places to keep it weird with bottomless cups to fuel students, conspiracy theorists, and hungover musicians. Today, however, the city's coffee landscape is much more sophisticated. Austin doesn't have the history of some other cities, but it makes this list because of the wellspring of newly opened shops that could hold their own against the best of Seattle or Portland. In 2014 alone, a half-dozen multi-roaster cafes opened, which still isn't nearly enough to feed the city's thirsty hordes of remote workers. Many of the new breed of shops still fly the slacker flag with seats full of musicians and DJs (Figure 8), but they've now elevated their espresso game with carefully curated beans from buzzed-about roasters like Four Barrel and Coava. On the other hand, a shop like Patika mixes a Design*Sponge-worthy interior with a selection of Austin's best roasters, and the cafe outpost of roaster Cuvée brings the "no Wi-Fi" trend to Texas, while also pioneering nitro cold brew (the first in the nation). And both Thunderbird and Jo's walk the tough balance between high-volume shops and serious coffee programs. Other roasters like Wild Gift and Tweed (which has footing in Dallas) are garnering national acclaim, while legacy roasters like Casa Brasil bring more specific regional offerings to the table. And the rabid nature of the scene is nowhere more apparent than at Thursday Night Throwdowns, where more than 100 coffee pros are known to gather to gawk at each other's latte art. Chi-town's most famous bean is one where you can see your reflection, but number two comes courtesy of Intelligentsia. Since its founding in 1995, Intelligentsia has gone bicoastal with a total of 10 shops, but the roaster's biggest contributions to the coffee world were setting and holding the standard for meticulous coffee sourcing, developing direct relationships with farmers, elevating the coffee economy as a whole, and bringing the brand's coffee to a much larger audience by partnering with hometown heroes like Jeff Tweedy. If Intelligentsia was Chicago's only dog in the coffee race, the city would still have an impressive resume, but there's a wealth of other buzzes out there. Longtime roaster Metropolis has had less of an outward expansion, but it's nearly as ubiquitous on the local landscape as well as the national stage thanks to the accolade of Roast Magazine's micro-roaster of the year in 2007 (Intelligentsia took home the macro trophy the same year!). Meanwhile innovative companies like Dark Matter are matching Midwestern work mentalities with experimental ideas like bourbon barrel aging and beer partnerships (with 3 Floyds no less! ), and you can even score a great cup while getting your bike fixed at Heritage Bicycles. Coffee culture in New York runs deep. The combination of hustle, bustle, and bitter cold winters makes a steaming Anthora plastic cup (“We are happy to serve you!”) a near-perfect symbol of the city, but it places lower on this list because there's more of an on-the-go than a sit down-and-enjoy mentality. That said, snobs have much to rejoice over. 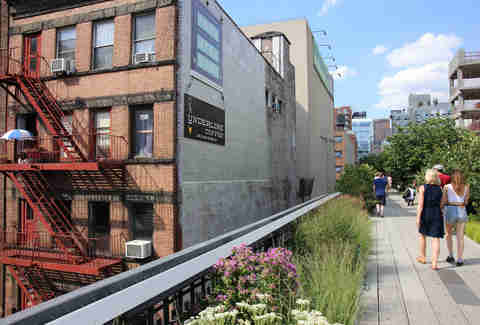 Despite an aversion to loiterers, coffee shop loyalty is as strong as anywhere, and tiny apartments make third spaces like Toby's Estate even more important. Much like in Los Angeles, Blue Bottle, Stumptown, and Intelligentsia have made their mark here, while hometown heroes like Ninth Street, Joe, and Grumpy have raised the game locally, with an honorable mention to Philly-based La Colombe, whose influence in Manhattan is undeniable. It may not have the same proliferation of micro-roasters as a West Coast city, but the flip of that is a handful of trendsetting concepts like the Nordic-centric Budin and the Colombian sticklers for freshness at Devoción. 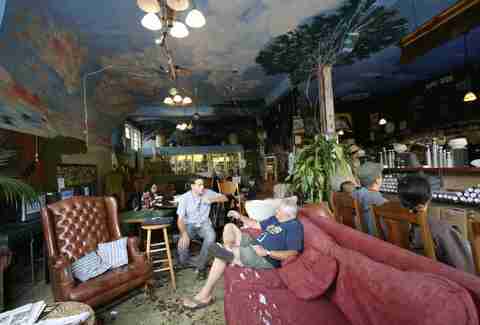 Then there are tiny shops like Everyman that most any coffee nerd would dream of having on their corner. Look for New York to climb the rankings on a list like this once the ratio of micro-roasters to $1 coffee carts starts to shift and the beanhead culture catches up with the West Coast. The Bay Area has a rich and steaming-hot history in coffee, dating back to the patron saint of specialty coffee, Alfred Peet. If you wanted to go back in time and stop Starbucks, he'd be a guy to terminate, but there's no denying his positive influence on the trajectory of the humble coffee bean. Flash-forward to the aughts and Phil Jaber was your man, pioneering a single-cup mentality that's been carried by third-wave standard-bearer Four Barrel, the city's most ubiquitous roaster, and Oaklanders' Blue Bottle, the fastest-growing coffee company in the country thanks to effortlessly cool innovations like selling iced coffee in cartons. Sightglass and Ritual lead the pack of roasters who've expanded to multiple shops and would be the pride and joy of smaller scenes, while dodging the Sam Adams stigma that comes with being the biggest little guys. Plus, Silicon Valley's influence is unavoidable through fads like Bulletproof, an army of laptop users needing reliable work spots like Workshop, and squeaky-clean design in cafes like Saint Frank and Wrecking Ball. And the bike messenger/hipper-than-thou crowd can always get a $4 toast at The Mill or a waffle with their espresso at Linea Caffe. Really the only thing keeping SF out of the top three is that it's not nearly as expansive as Cali's other top coffee city. Los Angeles knows sprawl like no one else, and over the past few years the city's coffee knowledge has finally caught up. 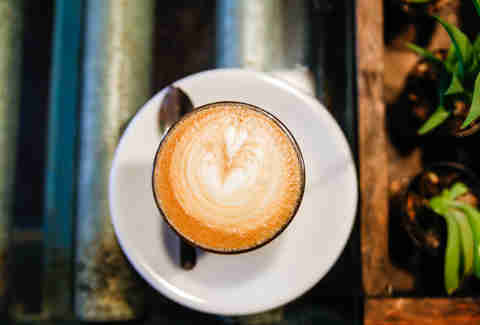 Quality beans and expert baristas have spread from the hippest 'hoods out to the distant suburbs, partly due to the influx of shops and roasteries from some of the nation's biggest and best like Intelligentsia, Blue Bottle, Stumptown, and Caffe Vita. While LA's largest players might not be native sons, the next crop of up-and-comers are what earns the City of Angels such high marks. Klatch Coffee is a homegrown empire that's become one of, if not the, largest specialty wholesaler in the country. Both Bar Nine and Healing made our list of best new roasters for ambitious warehouse cafe set-ups and coffee-judging pedigree, respectively. 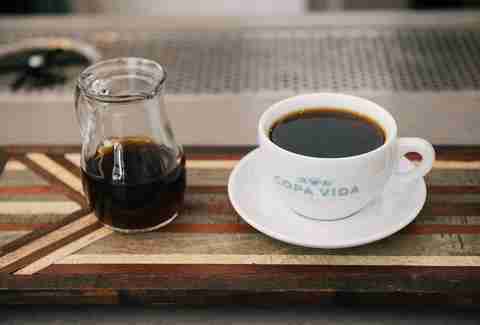 Compelling & Rich has been consistently cranking out +90-rated coffees, and Copa Vida is just a stone's throw away in Pasadena. When you're speaking about shops, it doesn't get much better than G&B and Go Get Em Tiger. It's rare that coffee nerds hold anything in such unanimously high regard, but the partnering shops' innovative approaches to service and quality control while maintaining an accessible attitude is a testament to their championship barista owners, the type of coffee talent for which LA has become a magnet. But beyond these coffee-nerd landmarks, there's a wealth of smaller niche shops that celebrate the personalities of their 'hoods like Culver City's Cognoscenti and Taza in Arcadia, and it's this widespread ability to find a superlative cup of coffee that puts LA past its denser coffee-obsessed neighbors to the North. As Portlandia proclaimed, the dream of the '90s is alive in Portland, and one of the decade's biggest aspirations was better coffee. The second wave may be credited to its neighbor to the North, but Portland's made huge strides towards catching up to its bigger brother. Stumptown has emerged as one of the largest specialty roasters in the nation, and although local coffee dorks might dub it “Chumptown” (and Seattle loyalists will gladly note that Stumptown's roaster apprenticed at Lighthouse), its five shops fuel the city with an incredible amount of incredible coffee, with beans making up a big part of the city's exports. 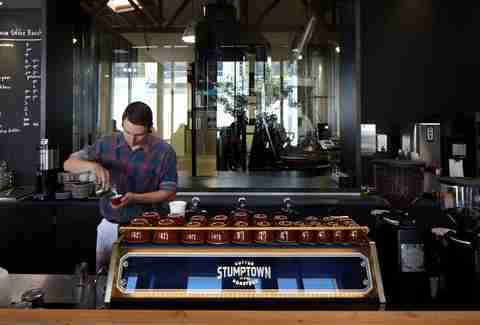 But beyond Stumptown, Portland still has much to be proud of. Heart proudly flies the flag of lightly roasted coffee, Portland Roasting has been paving the way for more sustainable and carbon-neutral coffee since 1996, and Coava's followed suit in a nearly zero-waste approach that still results in beans that are envied as far South as Austin, TX. Excuse the mixed hot-beverage metaphor, but no city in the country is steeped in as much coffee history as Seattle. No matter how you feel about the Green Lady, Starbucks set the groundwork for good coffee, so much so that despite the boom in smaller roasters, it's still the first thing on the mind of most American coffee drinkers. Thankfully, Starbucks has made the effort to bring the new wave of specialty coffee to its clientele through the opening of its state-of-the-art Reserve Roastery. 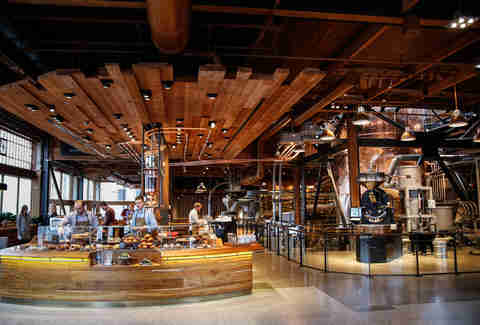 Starbucks might be the biggest thing to put Seattle on the map, but any self-respecting coffee snob will look right past it, posting up at the slow bar at Seattle Coffee Works, sneaking a peek into the roasting room at Victrola, or trying a flight of different Ethiopians at Slate. Take the trek to Fremont where Milstead is pouring some of the best cups in the city. 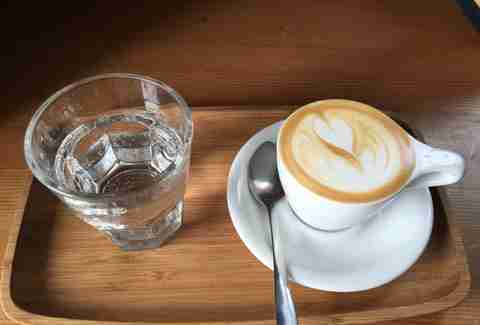 Hit up Elm in the Financial District for lighter brews from roasters with some of the most serious pedigree in the business, or let Analog or Broadcast prove just how trendy Capitol Hill is these days. While Portland's Stumptown might earn the city big points on a list like this, Seattle's answer is Caffe Vita, another larger specialty roaster whose single-origin mentality has earned it wholesale accounts across the country, from Portland, to LA, to New York. On the less consumer-facing side, Seattle companies like La Marzocco, Synesso, and Slayer supply much of the third-wave market with their espresso machines, and the Emerald City served as the first host of back-to-back iterations of the Specialty Coffee Association of America's yearly conference in 2014 and 2015. 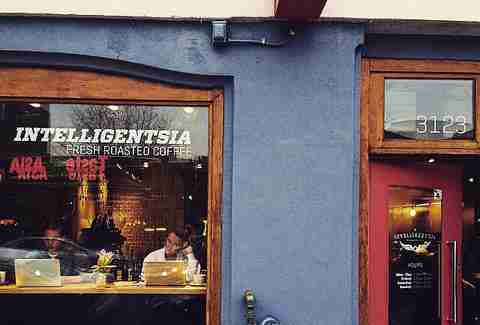 Younger coffee cities like Portland and Los Angeles might be snapping at Seattle's heels, but you're going to have a hard time finding any city as deeply grounded in coffee culture than the one on the Puget. Dan Gentile is a staff writer at Thrillist. He lives in Austin, TX, and yes that makes him a little biased. Follow his tweets sent from a stool at Figure 8 at @Dannosphere.